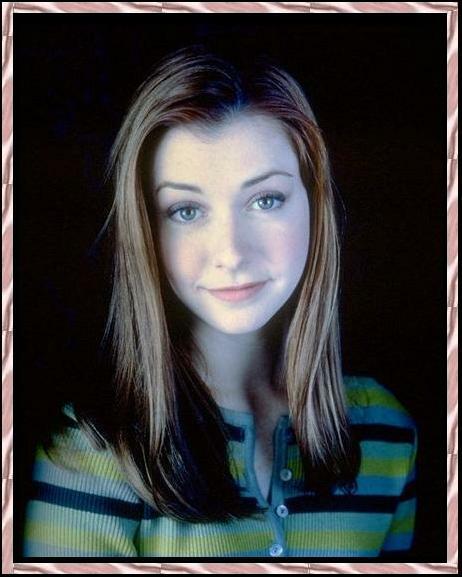 Alyson Hannigan plays the shy Willow, the friend and confidante of Buffy. Like Gellar, she started acting at a young age, landing movie roles such as that in "Dead Man on Campus". She began her career in Atlanta doing commercials for companies like McDonald's, Six Flags Amusement Parks and Oreo cookies until at the age of 11, she moved to Los Angeles in hopes of breaking into film and television. She was cast as Dan Aykroyd's misunderstood daughter in the feature film "My Stepmother Is an Alien." and went on to guest star on a number of popular television shows, including "Picket Fences" and "Roseanne"
In her free time the Dr. Seuss fan likes to surf the web, practice kickboxing and spend time with her dogs and cats. She is currently living in L.A.